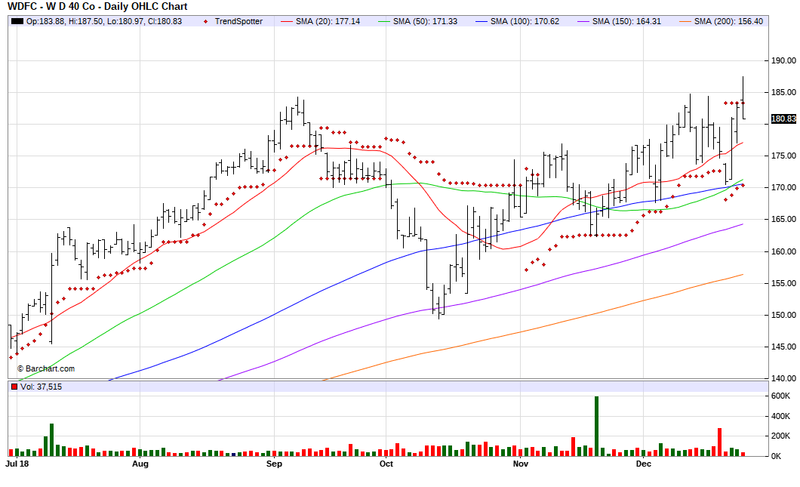 The Barchart Chart of the Day belongs to chemical products company WD-40(NASDAQ:WDFC). I found the stock by sorting Barchart's New 52 Week High list (only 4 stocks today) first by the most frequent number of new hihgs in the last month, then I used the Flipchart feature to review the charts for consistent price appreciation. The stock is presently a Trend Spotter Hold. WD-40 Company is a tribe of passionate, committed professionals, all dedicated to the same goal: to create positive lasting memories in every interaction they have. They're a global marketing organization dedicated to creating positive lasting memories by developing and selling products that solve problems in workshops, factories and homes around the world. They offer multi-purpose maintenance products, including aerosol sprays, non-aerosol trigger sprays, and in liquid form under the WD-40 Multi-Use brand for various consumer uses; and specialty maintenance products that comprise penetrants, degreasers, corrosion inhibitors, lubricants, and rust removers under the WD-40 Specialist brand name. The company also provides products under the WD-40 Bike product brand consisting of wet and dry chain lubricants, heavy-duty degreasers, and foaming wash products for avid and recreational cyclists, bike enthusiasts, and mechanics; multi-purpose and specialty drip oils, and spray lubricant products.